This is an old revision of this page, as edited by 165.155.200.116 (talk) at 12:42, 21 March 2012 (→‎Creation of the courts). The present address (URL) is a permanent link to this revision, which may differ significantly from the current revision. For the 1947 Soviet film about the trials, see Nuremberg Trials (film). The October 1, 1946 Süddeutsche Zeitung announces "The Verdict in Nuremberg." Depicted are (left, from top): Göring, Hess, Ribbentrop, Keitel, Kaltenbrunner, Rosenberg, Frank, Frick; (second column) Funk, Streicher, Schacht; (third column) Dönitz, Raeder, Schirach; (right, from top) Sauckel, Jodl, Papen, Seyss-Inquart, Speer, Neurath, Fritzsche, Bormann. Image from Topography of Terror Museum, Berlin. Coordinates: 49°27.2603′N 11°02.9103′E﻿ / ﻿49.4543383°N 11.0485050°E﻿ / 49.4543383; 11.0485050 The Nuremberg Trials were a series of military tribunals, held by the victorious Allied forces of World War II, most notable for the prosecution of prominent members of the political, military, and economic leadership of the defeated Nazi Germany. The trials were held in the city of Nuremberg, Bavaria, Germany, in 1945–46, at the Palace of Justice. 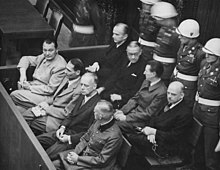 The first and best known of these trials was the Trial of the Major War Criminals before the International Military Tribunal (IMT), which tried 24 of the most important captured leaders of Nazi Germany, though several key architects of the war (such as Adolf Hitler, Heinrich Himmler, and Joseph Goebbels) had committed suicide before the trials began. The initial trials were held from November 20, 1945 to October 1, 1946. The second set of trials of lesser war criminals was conducted under Control Council Law No. 10 at the US Nuremberg Military Tribunals (NMT); among them included the Doctors' Trial and the Judges' Trial. This article primarily deals with the IMT; see the Subsequent Nuremberg Trials for details on those trials. British War Cabinet documents, released on 2 January 2006, showed that as early as December 1944, the Cabinet had discussed their policy for the punishment of the leading Nazis if captured. British Prime Minister Winston Churchill had then advocated a policy of summary execution in some circumstances, with the use of an Act of Attainder to circumvent legal obstacles, being dissuaded from this only by talks with US leaders later in the war. In late 1943, during the Tripartite Dinner Meeting at the Tehran Conference, the Soviet leader, Joseph Stalin, proposed executing 50,000–100,000 German staff officers. US President Franklin D. Roosevelt, joked that perhaps 49,000 would do. Churchill denounced the idea of "the cold blooded execution of soldiers who fought for their country" and that he'd rather be "taken out in the courtyard and shot" himself than to partake in any action. However, he also stated that war criminals must pay for their crimes and that in accordance with the Moscow Document which he himself had written, they should be tried at the places where the crimes were committed. Churchill was vigorously opposed to executions "for political purposes." According to the minutes of a Roosevelt-Stalin meeting during the Yalta Conference, on February 4, 1945, at the Livadia Palace, President Roosevelt "said that he had been very much struck by the extent of German destruction in the Crimea and therefore he was more bloodthirsty in regard to the Germans than he had been a year ago, and he hoped that Marshal Stalin would again propose a toast to the execution of 50,000 officers of the German Army." US Treasury Secretary, Henry Morgenthau, Jr., suggested a plan for the total denazification of Germany; this was known as the Morgenthau Plan. The plan advocated the forced de-industrialisation of Germany. Roosevelt initially supported this plan, and managed to convince Churchill to support it in a less drastic form. Later, details were leaked to the public, generating widespread protest. [clarification needed] Roosevelt, aware of strong public disapproval, abandoned the plan, but did not adopt an alternate position on the matter. The demise of the Morgenthau Plan created the need for an alternative method of dealing with the Nazi leadership. The plan for the "Trial of European War Criminals" was drafted by Secretary of War Henry L. Stimson and the War Department. Following Roosevelt's death in April 1945, the new president, Harry S. Truman, gave strong approval for a judicial process. After a series of negotiations between Britain, the US, Soviet Union and France, details of the trial were worked out. The trials were to commence on 20 November 1945, in the Bavarian city of Nuremberg. It was also agreed that France would become the permanent seat of the IMT and that the first trial (several were planned) would take place in Nuremberg. Martin Bormann I - G G Death Successor to Hess as Nazi Party Secretary. Sentenced to death in absentia. Remains found in Berlin in 1972 and dated to 1945. Hans Frank I - G G Death Reich Law Leader 1933–1945 and Governor-General of the General Government in occupied Poland 1939–1945. Expressed repentance. Wilhelm Frick I G G G Death Hitler's Minister of the Interior 1933–1943 and Reich Protector of Bohemia-Moravia 1943–1945. Authored the Nuremberg Race Laws. Hans Fritzsche I I I - Acquitted Popular radio commentator; head of the news division of the Nazi Propaganda Ministry. Tried in place of Joseph Goebbels. Walther Funk I G G G Life Imprisonment Hitler's Minister of Economics; succeeded Schacht as head of the Reichsbank. Released because of ill health on 16 May 1957. Died 31 May 1960. G G G G Death Reichsmarschall, Commander of the Luftwaffe 1935–1945, Chief of the 4-Year Plan 1936–1945, and original head of the Gestapo before turning it over to the SS in April 1934. Originally Hitler's designated successor and the second highest ranking Nazi official. By 1942, with his power waning, Göring fell out of favor and was replaced in the Nazi hierarchy by Himmler. Committed suicide the night before his execution. G G I I Life Imprisonment Hitler's Deputy Führer until he flew to Scotland in 1941 in attempt to broker peace with Great Britain. After trial, committed to Spandau Prison; died in 1987. G G G G Death Wehrmacht Generaloberst, Keitel's subordinate and Chief of the OKW's Operations Division 1938–1945. I - G G Death Highest surviving SS-leader. Chief of RSHA 1943–45, the Nazi organ made up of the intelligence service (SD), Secret State Police (Gestapo), Criminal Police (Kripo) and had overall command over the Einsatzgruppen. G G G G Death Head of Oberkommando der Wehrmacht (OKW) 1938–1945. Expressed regrets. I I I ---- Major Nazi industrialist. C.E.O. of Krupp A.G. 1912–45. Medically unfit for trial (died January 16, 1950). The prosecutors attempted to substitute his son Alfried (who ran Krupp for his father during most of the war) in the indictment, but the judges rejected this as being too close to trial. Alfried was tried in a separate Nuremberg trial for his use of slave labor, thus escaping the worst notoriety and possibly death. I I I I ---- Head of DAF, The German Labour Front. Suicide on 25 October 1945, before the trial began. G G G G 15 years Minister of Foreign Affairs 1932–1938, succeeded by Ribbentrop. Later, Protector of Bohemia and Moravia 1939–43. Resigned in 1943 because of a dispute with Hitler. Released (ill health) 6 November 1954 after having a heart attack. Died 14 August 1956. I I - - Acquitted Chancellor of Germany in 1932 and Vice-Chancellor under Hitler in 1933–1934. Ambassador to Austria 1934–38 and ambassador to Turkey 1939–1944. Although acquitted at Nuremberg, von Papen was reclassified as a war criminal in 1947 by a German de-Nazification court, and sentenced to eight years' hard labour. He was acquitted following appeal after serving two years. G G G - Life Imprisonment Commander In Chief of the Kriegsmarine from 1928 until his retirement in 1943, succeeded by Dönitz. Released (ill health) 26 September 1955. Died 6 November 1960. G G G G Death Racial theory ideologist. Later, Minister of the Eastern Occupied Territories 1941–1945. I I - - Acquitted Prominent banker and economist. Pre-war president of the Reichsbank 1923–1930 & 1933–1938 and Economics Minister 1934–1937. Admitted to violating the Treaty of Versailles. I - - G 20 years Head of the Hitlerjugend from 1933 to 1940, Gauleiter of Vienna 1940–1945. Expressed repentance. I G G G Death Instrumental in the Anschluss and briefly Austrian Chancellor 1938. Deputy to Frank in Poland 1939–1940. Later, Reich Commissioner of the occupied Netherlands 1940–1945. Expressed repentance. I I G G 20 Years Hitler's favorite architect, close friend, and Minister of Armaments from 1942 until the end of the war. In this capacity, he was ultimately responsible for the use of slave laborers from the occupied territories in armaments production. Expressed repentance. I - - G Death Gauleiter of Franconia 1922–1940. Publisher of the weekly newspaper, Der Stürmer. The executioner was John C. Woods. Although the rumor has long persisted that the bodies were taken to Dachau and burned there, they were actually incinerated in a crematorium in Munich, and the ashes scattered over the river Isar. The French judges suggested the use of a firing squad for the military condemned, as is standard for military courts-martial, but this was opposed by Biddle and the Soviet judges. These argued that the military officers had violated their military ethos and were not worthy of the firing squad, which was considered to be more dignified. The prisoners sentenced to incarceration were transferred to Spandau Prison in 1947. Justice Robert Jackson played an important role in not only the trial itself, but also in the creation of the International Military Tribunal, as he led the American delegation to London that, in the summer of 1945, argued in favour of prosecuting the Nazi leadership as a criminal conspiracy According to Airey Neave, Jackson was also the one behind the prosecution’s decision to include membership in any of the six criminal organizations in the indictments at the trial, though the IMT rejected this on the grounds that it was wholly without precedent in either international law or the domestic laws of any of the Allies Jackson also attempted to have Alfried Krupp be tried in place of his father, Gustav, and even suggested that Alfried volunteer to be tried in his father’s place Both proposals were rejected by the IMT, particularly by Sir Lawrence and Biddle, and some sources indicate that this resulted in Jackson being viewed unfavourably by the latter. One of the charges, brought against Keitel, Jodl, and Ribbentrop included conspiracy to commit aggression against Poland in 1939. The Secret Protocols of the German-Soviet Non-Aggression Pact of 23 August 1939, proposed the partition of Poland between the Germans and the Soviets (which was subsequently executed in September 1939); however, Soviet leaders were not tried for being part of the same conspiracy. Instead, the Tribunal falsely proclaimed the Secret Protocols of the Non-Aggression Pact to be a forgery. Moreover, Allied Powers Britain and Soviet Union were not tried for preparing and conducting the Anglo-Soviet invasion of Iran and the Winter War, respectively. In 1915, the Allied Powers, Britain, France, and Russia, jointly issued a statement explicitly charging, for the first time, another government (the Sublime Porte) of committing "a crime against humanity". However it was not until the phrase was further developed in the London Charter that it had a specific meaning. As the London Charter definition of what constituted a crime against humanity was unknown when many of the crimes were committed, it could be argued to be a retrospective law, in violation of the principles of prohibition of ex post facto laws and the general principle of penal law nullum crimen, nulla poena sine praevia lege poenali. In justice to the nations and the men associated in this prosecution, I must remind you of certain difficulties which may leave their mark on this case. Never before in legal history has an effort been made to bring within the scope of a single litigation the developments of a decade, covering a whole continent, and involving a score of nations, countless individuals, and innumerable events. Despite the magnitude of the task, the world has demanded immediate action. This demand has had to be met, though perhaps at the cost of finished craftmanship. In my country, established courts, following familiar procedures, applying well-thumbed precedents, and dealing with the legal consequences of local and limited events, seldom commence a trial within a year of the event in litigation. Yet less than eight months ago to-day the courtroom in which you sit was an enemy fortress in the hands of German S.S. troops. Less than eight months ago nearly all our witnesses and documents were in enemy hands. One criticism that was made of the IMT was that some treaties were not binding on the Axis powers because they were not signatories. This was addressed in the judgment relating to war crimes and crimes against humanity, which contains an expansion of customary law: "the Convention Hague 1907 expressly stated that it was an attempt 'to revise the general laws and customs of war,' which it thus recognised to be then existing, but by 1939 these rules laid down in the Convention were recognised by all civilised nations, and were regarded as being declaratory of the laws and customs of war which are referred to in Article 6 (b) of the [London] Charter." The implication under international law is that if enough countries have signed up to a treaty, and that treaty has been in effect for a reasonable period of time, then it can be interpreted as binding on all nations, not just those who signed the original treaty. This is a highly controversial aspect of international law, one that is still actively debated in international legal journals. Interpreters were recruited and examined by the respective countries in which the official languages were spoken: United States, United Kingdom, France, the Soviet Union, Germany, Switzerland, and Austria, as well as in special cases Belgium and the Netherlands. Many were former translators, army personnel, and linguists, some were experienced consecutive interpreters, others were ordinary individuals and even recent secondary school-graduates who led international lives in multilingual environments. It was, and still is believed, that the qualities that made the best interpreters were not just a perfect understanding of two or more languages, but more importantly a broad sense of culture, encyclopædic knowledge, inquisitiveness, as well as a naturally calm disposition. With the simultaneous technique being extremely new, interpreters practically trained themselves, but many could not handle the pressure or the psychological strain. Many often had to be replaced, many returned to the translation department, and many left. Serious doubts were given as to whether interpretation provided a fair trial for the defendants, particularly because of fears of mistranslation and errors made on transcripts. The translation department had to also deal with the overwhelming problem of being understaffed and overburdened with an influx of documents that could not be kept up with. More often than not, interpreters were stuck in a session without having proper documents in front of them and were relied upon to do sight translation or double translation of texts, causing further problems and extensive criticism. Other problems that arose included complaints from lawyers and other legal professionals with regard to questioning and cross-examination. Legal professionals were most often appalled at the slower speed at which they had to conduct their task because of the extended time required for interpreters to do an interpretation properly. Also, a number of interpreters were noted for protesting the idea of using vulgar language reflected in the proceeds, especially if it referenced Jews or the conditions of the concentration camps. Bilingual/trilingual members who attended the trials picked up quickly on this aspect of character and were equally quick to file complaints. ^ a b c Overy, Richard (27 September 2001). Interrogations: The Nazi Elite in Allied Hands (1st ed.). Allen Lane, The Penguin Press. pp. 19–20. ISBN 0713993502. ^ Minutes of 2nd meeting of BWCE and the Representatives of the USA. Kew, London: Lord Chancellor's Office, Public Records Office. 21 June 1945. ^ a b Rough Notes Meeting with Russians. Kew, London: Lord Chancellor's Office, Public Records Office. 29 June 1945. ^ Overy, Richard (27 September 2001). Interrogations: The Nazi Elite in Allied Hands (1st ed.). Allen Lane, The Penguin Press. p. 15. ISBN 0713993502. ^ Eugene Davidson, The Trial of the Germans: An Account of the Twenty-Two Defendants Before the International Military Tribunal at Nuremberg, University of Missouri Press, 1997, ISBN 9780826211392, pp. 30-31. ^ "Nuremberg Trial Proceedings Indictment: Appendix B". ^ Kershaw, Ian. Hitler: A Biography, W. W. Norton & Co. 2008, pp 932-933. ^ Clapham, Andrew (2003). "Issues of complexity, complicity and complementarity: from the Nuremberg Trials to the dawn of the International Criminal". In Philippe Sands (ed.). From Nuremberg to the Hague: the future of international criminal justice. Cambrifge University Press. ISBN 0521829917. The tribunal's eventual decision was that Gustav Krupp could not be tried because of his condition but that 'the charges against him in the Indictment should be retained for trial therafter if the physical and mental condition of the defendant should permit'. ^ Shnayerson, Robert (October 1996). "Judgment at Nuremberg" (PDF). Smithsonian Magazine. pp. 124–141. Archived from the original (PDF) on 30 April 2011. The trial removed 11 of the most des- picable Nazis from life itself. In the early morning hours of Wednesday, October 16, 1946, ten men died in the courthouse gymnasium in a botched hanging that left several strangling to death for as long as 25 minutes. ^ "The Trial of the Century– and of All Time, part two". Flagpole Magazine. 17 July 2002. p. 6. Archived from the original on 2 March 2009. the experienced Army hangman, Master Sgt. John C. Woods, botched the executions. A number of the hanged Nazis died, not quickly from a broken neck as intended, but agonizingly from slow strangulation. Ribbentrop and Sauckel each took 14 minutes to choke to death, while Keitel, whose death was the most painful, struggled for 24 minutes at the end of the rope before expiring. ^ Overy, Richard (27 September 2001). Interrogations: The Nazi Elite in Allied Hands (1st ed.). Allen Lane, The Penguin Press. p. 205. ISBN 0713993502. ^ Persico, Joseph E. Nuremberg: Infamy on Trial. Penguin Books, 1995, p. 111. ^ a b c Persico, Joseph E. Nuremberg: Infamy on Trial. Penguin Books, 1995, p. 62. ^ Smith, Bradley F. Reaching Judgment At Nuremberg. Basic Books, 1977, p. 33. ^ Smith, Bradley F. Reaching Judgment at Nuremberg. Basic Books, 1977, p. 34. ^ Persico, Joseph E. Nuremberg: Infamy on Trial. Penguin Books, 1995, p. 396. ^ Neave, Airey. Nuremberg: A Personal Record of the Trial of the Major Nazi War Criminals. Grafton Books, 1978, p. 24. ^ Neave, Airey. Nuremberg: A Personal Record of the Trial of the Major Nazi War Criminals. Grafton Books, 1978, p. 339-340. ^ a b Neave, Airey. Nuremberg: A Personal Record of the Trial of the Major Nazi War Criminals. Grafton Books, 1978, p. 297. ^ "Yearbook of the International Law Commission, 1950". Untreaty.un.org. Retrieved 2009-04-04. ^ See, e.g., Zolo(Victors' Justice (2009) by Danilo Zolo, Professor of Philosophy and Sociology of Law at the University of Florence. ^ See Paper of Jonathan Graubart, San Diego State University, Political Science Department, published online Graubart Article, referring to the ex post facto nature of the charges. ^ "The Legacy of Nuremberg". PBS Online / WGBH. 1 March 2006. Retrieved 23 November 2011. ^ "Motion adopted by all defense counsel". The Avalon Project: Nuremberg Trial Proceedings volume 1. Lillian Goldman Law Library. 19 November 1945. Retrieved 23 November 2011. ^ BBC News. 1945: Nuremberg trial of Nazis begins. November 20, 1945. ^ "German Defense Team Clobbers Soviet Claims". Nizkor.org. 1995-08-26. Retrieved 2009-04-04.